THE JEWISH-CONTROLLED MEDIA WILL EITHER SMEAR OR IGNORE a Presidential candidate they don’t like. Ron Paul is now on the ignore function of the Jews who control the American media. The Jewish-run Fox News Channel has been pushing the Jewish neocon agenda that controls both the Bush Administration and US foreign policy with regard to Zionist interests world-wide. * Rupert Murdoch: His mother, (by which Jews trace their racial designation), is the Jew, Elisabeth Joy Greene. ~ Rupert Murdoch’s, News Corporation, owns Fox Television Network, Fox News, DIRECTV, TV Guide, Wall Street Journal, New York Post, and The London Times. * Peter Chernin: New York born Jew. CEO of Murdochâ€™s News Corporation. * Mark Kaner: President of 20th Century Fox International Television. * Mitchell Stern: CEO of Fox satellite division, DIRECTV. * THE JEWISH-CONTROLLED MEDIA decides what political candidates will get coverage and what opinions the masses should have regarding these candidates. * THE JEWISH LOBBIES donate $$$ to political candidates they like and to political candidates they know will ruin candidates they hate. 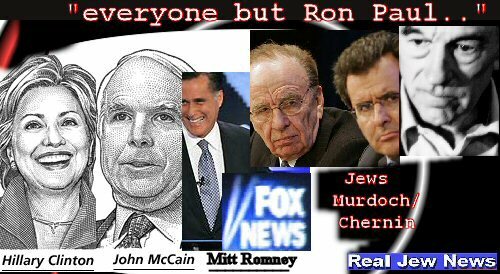 Because the Jews hate Ron Paul they are donating $$$ to the also ran Republican candidate, John McCain. Is it any surprise then that we now see John McCain’s picture splattered all over the news these days? * THE JEWISH-CONTROLLED PRESS, because they hate Ron Paul, omit him as a candidate. The Wall Street Journal, in their recent article “A Snapshot of the Presidential Campaign” HERE, every single candidate is listed *except* for the front-runner Ron Paul! 1) Ron Paul is against the Zionist-promoted War in Iraq. 2) Ron Paul is against the Jewish-owned private banking consortium known as The Federal Reserve Bank. Until Americans wake up to the fact that Jews do not care about anyone but themselves and what serve *their* interests, we will have a Jewish-run government. And until the Jews become Christians like Ron Paul, and are chased out of politics, *no* Presidential Campaign will be “democratic.” Candidate Ron Paul Take Notice! The Jewish media have not ruined a democracy, they have ruined the constitutional republic and re-present it as a democracy. Democracy is mentioned nowhere in the constitution, the bill of rights or the declaration of independence but Karl Marx did advocate “democracy” as a final outcome of the world proletarian revolution where the illusion of the “right thing” would be voted in because the majority desires it. With the Zionist Jew owned media having to sway through feel-good propaganda only 50% + 1 of voter’s to get the simple majority to vote in whatever and whoever the Jewish masters desire. Just look at the outcome of most any of the National Liberation Movements around the planet which are nothing less than proletarian revolutions patterned after the 1917 Russian revolution (which was patterned after the French Revolution). Of course the International Jewish banking cartel is nowhere to be seen in these messes but it is their undertaking and you soon see their monopolized financial presence in the newly emerged “democracy”. In more advanced societies like the US, Canada, Australia, England, etc., the devise has been a gradual,cultural revolution to hand the Jewish bankers control over the money. In the less developed, so-called “third world” nations violent, bloody overthrow style revolution in all it’s costumes is employed such as in El Salvador, Nicaragua, Peru, the South African countries, etc. It’s a clever scam and the Jewish banking cartel and their useful idiot subordinates will continue this successful scam until the world wakes up which better be soon. May he be strong enough to resist the zionist treachery! True democracy comes after the destruction of the Zionists’ influential corrupt system in Washington and many other countries. This way we get rid of the blood-thirsty Jewish power from the entire world. After that the world will be peaceful again! Jews are much smarter than Americans. Americans are controlled by Jews because Americans are stupid and like other people to think for them. The world hates America and most Americans don’t even know why. Jews control the U.S. economy and they control the media and government. It is very easy for any Jew to outsmart any American. The only way for America to win is to run every single Jew out of America and stop giving Israel money. Jews are like rats. They are hard to get rid of. There is obviously a reason why they got ran out of Europe. There are many reasons why they need to be ran out of America. Let Mexico have them. The stupid Americans need to start taking control of their country instead of letting the filthy jews control them. The filthy Jews represent only 2% of the U.S. population. That shows how smart they are to be able to control the most powerful country in the world with only 2% of the population Jews. I recommend running all Jews out of America. Stop pinning all your hopes on Ron Paul. If he gets in he will be assassinated and/or stonewalled by Congress and the Senate. We need more Ron Pauls. Americans are not stupid, but they are shamefully ignorant. (1) The major media in America are owned or controlled by Jews, who are not necessarily against America but are strongly supportive of Israel and place their news organs at the service of Israel. The lack of balanced, fair information in the mainstream media means that the American people can’t know the reality of things even if they wanted to. (2)The enormous resources of the Jewish community are placed at the service of Jewish/Israeli causes. American members of Congress are terrified to criticise Israel for anything at all because they know that unlimited cash will be at the disposal of any opponent for office. It remains to be seen if American will have the courage to try to regain control over their own country, or if the cowards in congress will allow the country to self-destruct. Should be an interesting decade coming. Political Correctness is behind Americans’ unwillingness to even ask the question: ARE THE (so-called) “Jews” really behind the entire historical push, for a “New World Order”. PC got it’s start in the USSR. It was (so-called) “Jews” who overthrew the Romanovs. Jacob Schiff, Rothschild-agent on Wall St., at Kuhn-Loeb, gave Trotsky $20 Million, before Trotsky boarded a ship, in NY Harbor, bound for Russia, in 1917. It’s all about being able to print as much money as you feel is necessary, to bail out your cronies on Wall St., buy U.S. Congress, and wage as many wars as you can, primarily as an excuse to further the NWO, ‘overseas’, as well as an excuse to develop the police state in Amerika. JFK “The President and the Press” Speech, before the American Newspaper Publishers Association. Waldorf-Astoria Hotel, New York, NY. Note: JFK was talking about the VERY SAME CONSPIRACY that David Duke is talking about, in the 1st Video (above). Since 1913, the U.S. Military has been used as the spear-point, in the push for a New World Order, with it’s ONE WORLD GOVERNMENT. This is what global warming (”AGW”) is about, as well the completely fraudulent ‘war on terror,’ as well as the engineered/orchestrated current global financial crisis. Currently, Ron Paul is most likely the REAL front-runner in the 2012 Presidential (S)election, as proven vote fraud reveals. Americans are tired of all the corruption - the 2008 Bailouts, Obama’s EMPTY PROMISES, his signing of the NDAA, the ENDLESS WAR(s), and 22% Unemployment, and over 10% Inflation, while the so-called ‘Fed’ continues to print currency (FRNs) like there is no tomorrow. AND, the fact that Wall St. insiders have positions at the “Justice” (ie, JUST-US) Dept, and therefore, there have been no handcuffs, despite EGREGIOUS, IN-YOUR-FACE (UN-PRECEDENTED) RECORD-LEVELS OF FINANCIAL FRAUD, and THEFT, on Wall St.
Putin just got elected. There is still hope for the world. Chavez is still there. Ahmadinejad is still there, and has no nuke. There is still hope, for the world. Now, if only Obama can reign in, or ignore Netanyahu. Theres a funny thing about the word democracy. If you add an N you will make the word DEMON-CRACY. As long as Americans are content watching the infantile — and too often VILE — nonsense spoon-fed to them by the mega-moguls in the TV conglomerates, and pay exorbitant prices for movie tickets to witness the same level idiocy in movie-theaters, their I.Q.’s will remain at the level of room-temperature. Thus, they will remain docile subjects, oblivious to the chains that are being forged for their heirs. As soon as the destruction of the Constitution is completed by the Zionists who control this once great nation, freedom will end. Zionists hate Democracy. Israel never will have a Constitution with a Bill of Rights, because there is nothing in Talmudism which accepts the concept that all men (humans) are equal under the law. A supremacist religion, by definition, excludes all who are not included in the circle of the self-annointed supreme beings — and thereby excludes the possibility of equality under the law. What, then, shall be our response to those intent on enslaving us? Look no further than the New Testament: Love those who despise you. Brother Nathanael’s web tells us who they are. Any presidential candidate can easily win the presidency by promising to give the people Bureaus of Public Oversight. It is so simple. Those bureaus can save our country and clean out every politician getting rich from his job. The American people deserve the misery they are suffering. They are too unconcerned to wake up and smell the roses. Winston Churchill was right when he said, “The best argument against democracy is a five minute conversation with an average American. Fast forward to December 13, 2016. Trump is no Ron Paul, not even close. Paul is a true statesman, an iconic figure. Trump, another Jewish sock puppet. Look at who he’s choosing for the various positions. Mostly Jews. Both Hillary & Trump were the Jewish choices given us. We have been fooled again.